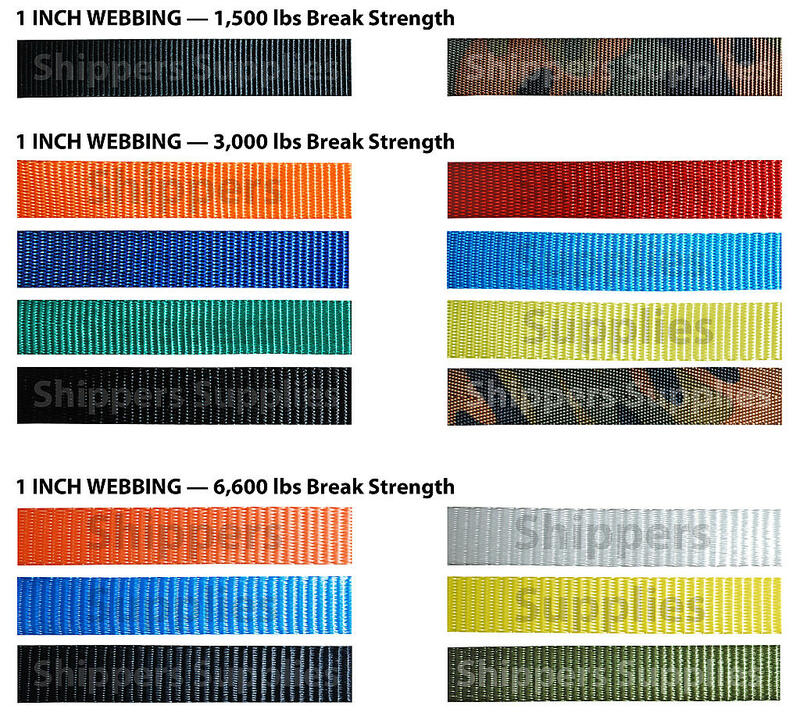 Our 1” Tie Down Webbing comes in 1,500 lbs, 3,000 lbs, 6,600 lbs, and other break strengths. We also have a variety of different colors available including camo. Our webbing is extremely durable for a variety of different loads. Whether you’re working with bulky and heavy objects or small and uniquely shaped objects, our webbing is proven to get the job done right. Our polyester and nylon webbing comes in many different colors and sizes. The webbing straps are designed to easily tie down with any ratchet or ring and are proven to last. What is Tie Down Webbing? Tie Down Webbing is the group of materials that Ratchet Straps, Cambuckle Straps, and Recovery Tow Straps are made out of. The material is usually made up of polyester or nylon. WARNING: Do not ever exceed the working load limit of any strap at anytime. Remember the assembly is only as strong as its weakest link and should be inspected before every use. Some of the color choices we offer for our 1 inch tie downs can be found below.